Welcome To Bonnes Amies! : Crabtree & Evelyn perfect for stockings! A seasonal spectacular and perfect stocking stuffers for last minute shoppers. 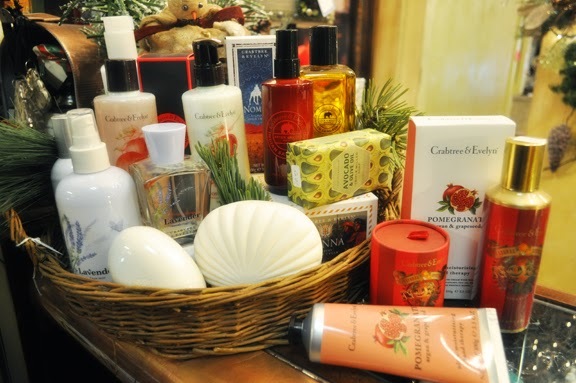 Our Crabtree & Evelyn soaps, lotions, bath & shower gels, and hand therapies soothe the stressed soul! Our favorites? The Pomegranate Hand Therapy, Indian Sandalwood Shave Balm & Soaps for men, and the Noël Home Fragrance Spray...warm mulling spices, fruity persimmon, and fresh-scented balsam fragrance reminiscent of holidays past. Quench dry skin with our Pomegranate, Argan & Grapeseed Body Lotion. A blend of nourishing moisturisers and fresh pomegranate, fig and citrus fragrance, this revitalising lotion is infused with sesame oil and ginger and grapeseed extracts to help condition your skin. So it’s left soft, scented and ready to face the day. The perfect finishing touch after a velvety smooth shave, our Indian Sandalwood After Shave Balm is formulated with soothing and protective oat kernel extract, while a blend of sweet almond oil and jojoba ester conditioning extracts and moisturising shea butter help keep skin richly hydrated. Leaving the subtle aroma of sandalwood blended with notes of spicy cypress, zesty bergamot and vetiver for a distinctly masculine finish. Fresh, scented air reminiscent of holidays past. There’s nothing quite like it to make the season extra special. Our Noël Home Fragrance Spray infuses the most cherished of spaces with a fragrant burst of warm mulling spices, fruity persimmon, and fresh-scented balsam. Just one spritz and it’s pure splendor.